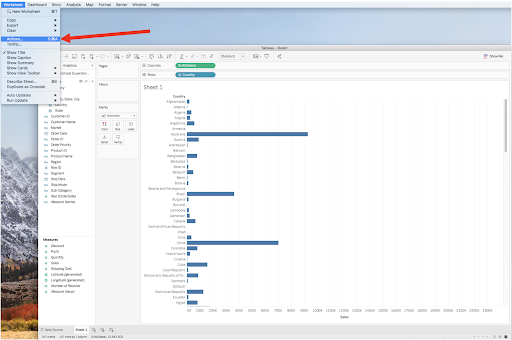 At Inviso, we sometimes get requests from customers who want an alternative to the conventional drill-down option in Tableau - the one using the plus and minus sign that appear when you hover over the column headers. There are a few ways to work around this, but none of these methods are particularly elegant. So.. 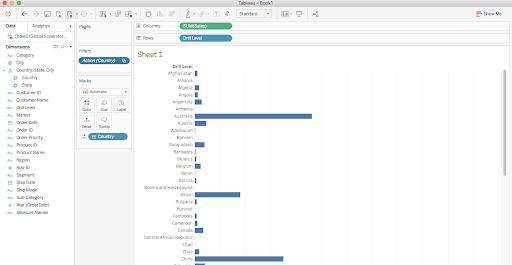 In this post, I am going to show you a neat way to drill between two levels in a hierarchy by clicking a point in the worksheet. The GIF below illustrates the concept - we can toggle between the country and the state level by clicking the bars in the chart. 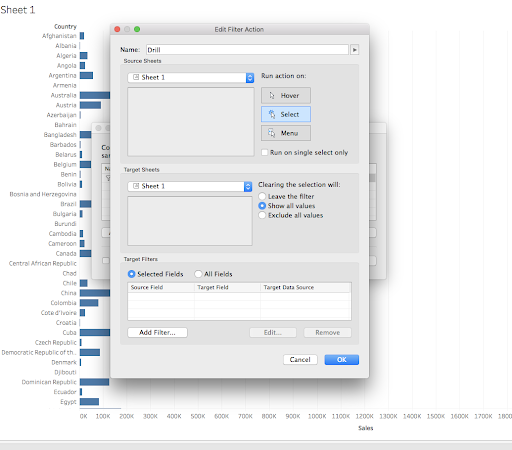 To some people this probably feels like a more natural way of interacting with data. The method covered today however only allows drilling down a single level. 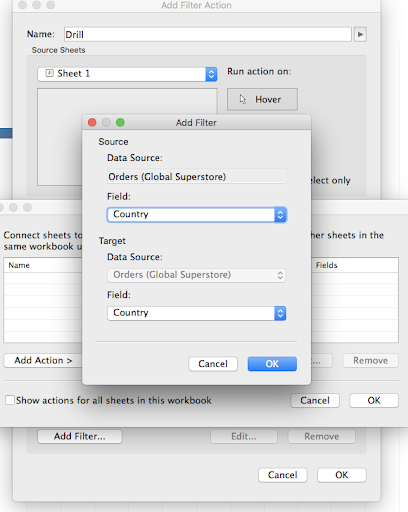 Using the Superstore data, the following steps will show you how to allow the user to drill from the country level to the state level by clicking the countries in the worksheet. Step 1:Go to your worksheet and find worksheet -> actions. 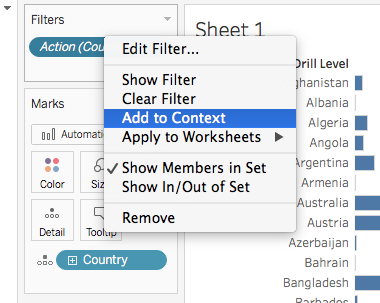 Click Add filter and choose Country in field. 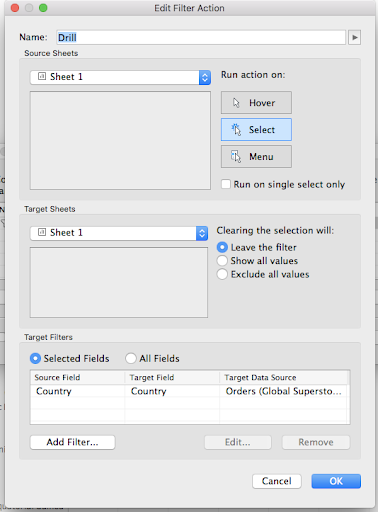 Step 5:Edit the action so it is configured to Leave the filter when nothing is selected. 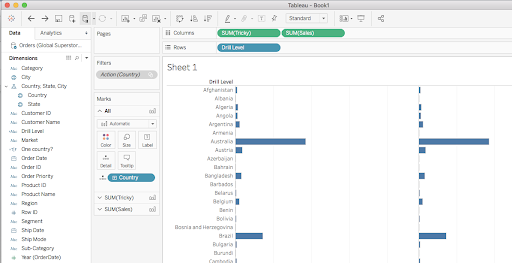 Step 8:Leave the Tricky calculation on the Columns shelf and form a dual axis, that has the same aggregation as the one you are showing (in this case the SUM). 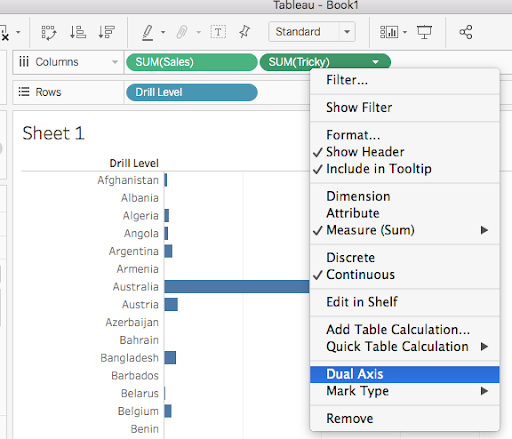 Step 10Form a dual x-axis: Notice that the SUM(sales) should be to the right of the Tricky calculation in order for the drill to work optimally. 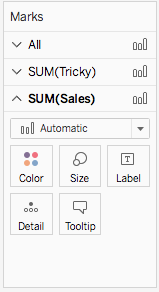 If all the steps were performed correctly, you should be able to drill down by clicking the bars in the worksheet.